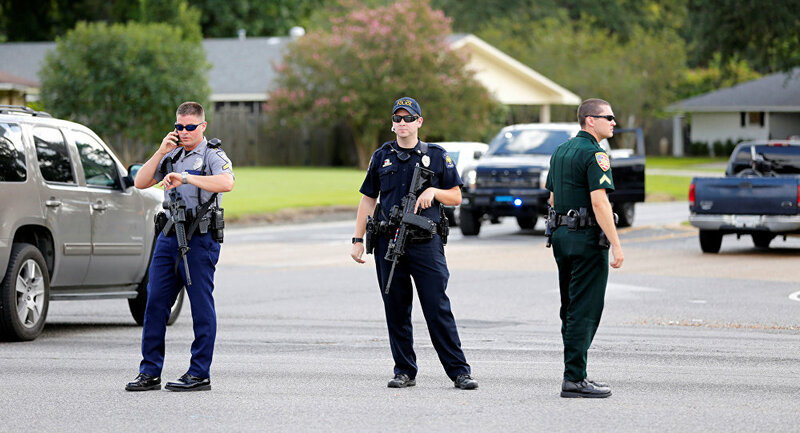 On Saturday, at least one gunmen opened fire on Baton Rouge Police officers killing three and wounding at least four others. Local news reports that the gunmen has since been killed by police, but city officials caution that it is still an active shooter situation with authorities still searching for two other gunmen. One of the gunmen on the loose is reported to be barricaded right now reports WAFB Channel 9. ​In the video, police officers appear to be rushing in to respond to an incident when they were suddenly ambushed by the gunmen. The loud clap of an assault rifle fills the air in quick succession as the situation went terribly wrong.